Six humble ingredients. Fifteen minutes. A big, beautiful Tuscan bread salad that serves eight. There's a reason this is one of our top-rated favorites! 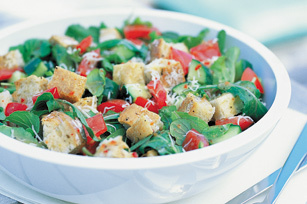 Arugula (ah-ROO-guh-lah), with its peppery mustard flavor, is a popular salad green used in Italian cooking. Substitute romaine lettuce for the arugula.